The use of face-masks, hitherto confined to the hospitals and other medical facilities, have now become fashionable on the streets of Lagos, thereby widening the clientele base of the dealers of the product. It is now common to see men and women selling face masks on the streets of Lagos. And in Jos, the capital of Plateau State, wearing of hand gloves is now the in-thing. No thanks to the severe harmattan currently ravaging the entire country. Sellers of warm clothing, from socks, sweaters, cardigans to caps of various types are now making brisk business as people scramble to buy these items to keep themselves warm. 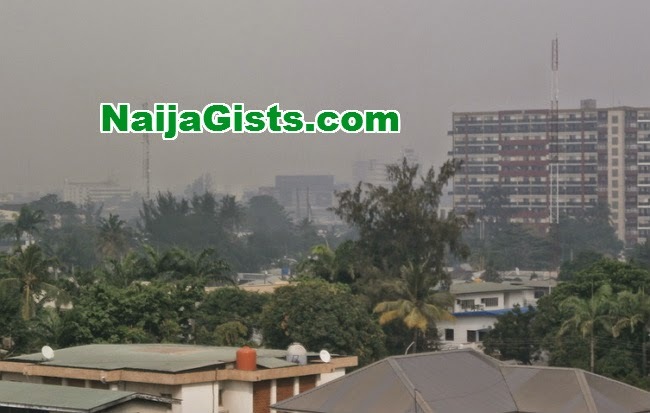 In Lagos, the state government has urged residents to take precautionary measures against the severe harmattan being currently experienced in the state. Consequently, government cautioned the people on bush and waste burning during this period to avoid fire outbreaks. 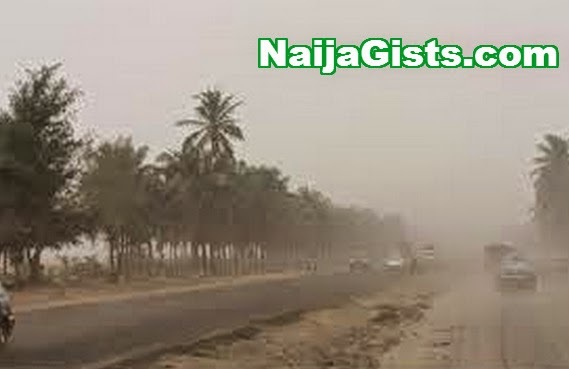 As with other weather conditions, harmattan comes with a variety of health and environmental hazards. Common cold and its symptoms such as catarrh, sneezing and coughing are very rampant during harmattan. Asthma patients suffer mostly during this period due to dusty environment. The same goes for sickle cell disease patients whose crises are triggered frequently during harmattan due to the cold. The skin, the eyes and the respiratory tract which directly connect with the atmosphere, the latter via the nose and mouth, are most susceptible to the unpleasant effects of the season. The skin is generally dry with associated cracking of the lips, sole of the feet and even the skin itself. The body extremities such as the hands and feet are sometimes too cold to produce distasteful signs. Babies and the elderly are principally prone to hypothermia (core body temperature below 35 degrees centigrade) due to sub optimal regulating mechanism. Aside from the health hazards, harmattan’s dry winds are capable of enflaming untended embers into raging fires that can effortlessly get out of control causing destruction of lives and property. Hence, fire outbreak is one of the major fallouts of this period. Between November and March, quite a lot of fire outbreaks are often recorded since there is dry wind, which makes it easy for fire to spread at the slightest ignition. It is often common with farmers to burn bushes in preparation for cultivation in the next farming season. Unfortunately, this act of bush burning often results in severe losses to farmers as they repeatedly find it difficult to curtail the rage of the fire which, aided by the harmattan haze, usually extends beyond imagination. Many rural communities have lost hitherto buoyant and thriving farmlands to the rage of uncontrollable harmattan fire, thereby subjecting the natives, whose mainstay of income is farming, to avoidable pains and anguish. In some instances, some have committed suicide as a result of enormous damage caused to their farmlands by uncontainable harmattan fire. The harmattan season equally takes its toll on transportation. Be it by air, road or on water, travelling could be very risky during this season. The change in weather condition during this period usually occurs when the temperature drops to the dew point of saturated air that condenses to reduce visibility drastically and cut down on the vision of a driver to 400 meters or less thus creating dangerous driving conditions. Many lives can be lost to this precarious harmattan condition as drivers, either out of ignorance or sheer disregard for the changing weather condition, easily fall victim. In fact, air flights have had to be rescheduled to prevent crashes during this season. It is, therefore, important for motorists to drive with lights on low beam in view of reflections from high beams that heighten poor visibility during this period. 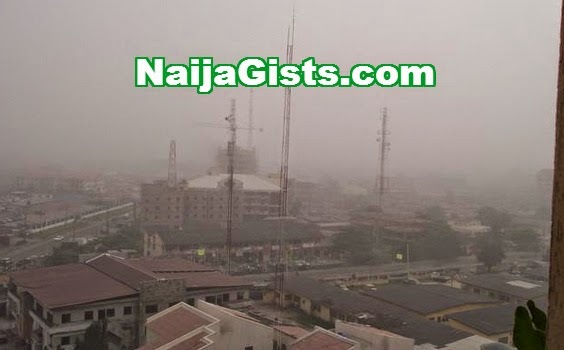 To effectively curb the bad effects of the harmattan season, everybody must take protective measures against the harmful effects of this season. Since there is severe cold mixed with dust, people with asthmatic conditions and any sort of inhalant allergies need to take precautions. This is the period when the asthmatic suffers more crises. Therefore, it is not out of place for this group of people to use masks to cover their noses and to always take their inhalers with them wherever they go. Many also suffer pneumonia and bronchitis, especially the very young and the aged. Those that are allergic to cold should also endeavour to go for thick clothing that can cover them up and to take their baths with warm water as hot water strips away oils in the skin, leaving it dehydrated. Their bodies should be rubbed with eucalyptus oil to keep them warm. The skin can be kept healthy through regular use of appropriate petroleum jelly products and shea butter or olive oil which lock and seal the oil in the skin to prevent dryness. Excessive intake of caffeinated drinks (Antihistamines) can be dehydrating to the skin, and the key thing to survive Harmattan is moisture. So, switching to decaffeinated drinks will help to retain moisture in the skin. Similarly, it is also advisable that people take lots of fluids to make up for loss of water from the body. 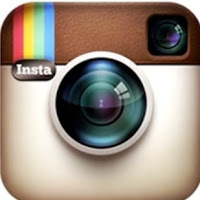 It is also advisable that people improve on their hygienic pattern during this period. It is, for instance, unhealthy for people to patronize all manner of food hawkers throughout the season as food borne diseases can be easily transmitted during this season due to much dust circulating in the environment. Fruits, vegetables and other such items must also be thoroughly washed before eating to prevent food borne diseases. The public should be sensitized through campaigns on how to prevent harmattan fire outbreaks and other related disasters. It is the failure of the members of the public to heed the advice given that has resulted in needless harmful incidents during this season. It is essential for all disaster and emergency management agencies, across the country, to draw up a scientific contingency plan to effectively combat fire outbreaks and other harmattan connected disasters. Strategies to reduce susceptibility should be entrenched in vulnerability assessment and enhanced discernment of all options that are available to reduce the exposure of the people to the adverse effects of the harmattan season.